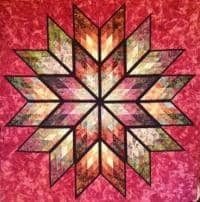 This class will teach you to construct a double eight-pointed star with a color wash of light fabrics in the center to darker fabrics on the outside edges. All of the diamond blocks are paper pieced and then edged with an accent fabric. This class is designed for confident beginner to intermediate quilters, but anyone is welcome to join us.